In the last article we explained the difference between cooled and uncooled cameras and the respective detectors, microbolometer and photon-counting ones. But these technical characteristics aren’t enough to determine a thermal camera’s performance and make a right buying choice. Understanding the importance of the detector’s resolution and its pixel pitch, as well as image processing, optics, and lens design (topics for the next article), will make sure you get the right and most efficient system for your applications. At the core of the thermal system, there is an IR detector, which consists of a thermal pixel array (TPA). Pixel array looks like a rectangular matrix of pixels. The distance (microns) between the centers of two adjacent pixels on the detector array is the pitch (also called pixel size). A thermal camera’s TPA operate by detecting photons at particular wavelengths and then generating an electrical charge or voltage in relation to the number of photons detected at each pixel. This charge or voltage is then measured, digitized, and used to construct an image of the object or scene that emitted the photons. A detector’s resolution is the first element in determining a camera’s ability to generate a high-quality image. 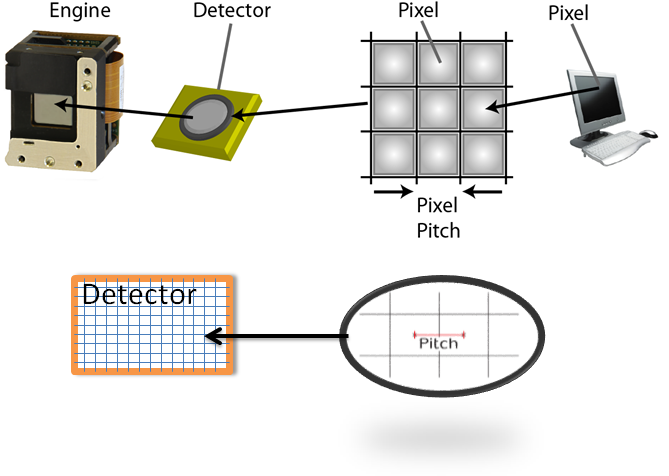 The more detector elements (pixels) a detector has, the higher its resolution, therefore the more energy will be gathered, and the more detail you’ll be able to see in the image. Higher resolution IR cameras can detect smaller objects from farther away. Pixel size is the one responsible for level of detail. Pixels are typically measured in micrometers, or “microns,” and smaller pixel sizes are better— the smaller the pitch, the more detail you’ll see. Another fine point in detector design is fill factor (or density) – the space between pixels on the detector that has to be interpolated when the image is formed electronically. Higher pixel density results in a more detailed image. Inclement conditions – fog, smoke, and precipitation reduce thermal contrast; cameras with higher resolution will continue providing a superior image. Be aware and don’t confuse detector resolution and display resolution because some manufacturers might boast about a high-resolution LCD while they might have a low-resolution detector. When choosing a camera, imager format is an important specification to consider. Imager format is basically the number of pixels on the detector array. To determine a camera’s imager format, typically a standard two-dimensional matrix is used. High resolution thermal cameras often have a 640×480 detector, which delivers 307,200 pixels; compare that to 76,800 in a thermal imager with a 320×240 detector. Standard formats are 160×120 (19,600 pixels), 384×288 (110,592 pixels), 640×480 (307,200 pixels), 1024×768 (786,432 pixels). It must be noted that a bigger imager format doesn’t improve the visibility of an object (object is not any larger, but the same size), it determines the scene size or range. Typically, the bigger the format, the bigger usable range of the camera. One more important characteristics which is related to the image processing capabilities of a camera. Frame rate is the speed at which an imager updates its output information to be displayed on a screen. A 9 Hz camera does so 9 times per second, and a 60 Hz camera – 60 times per second. It is a concept similar to frame refresh rates of a PC or TV, only at a much higher values. Higher frame rate means faster image updating. In the next article in this series, we will look at camera lens and explain main optics terminology to help you make the best decision and buy a thermal camera that will suit your needs.